We are big believers in continuing education and attending professional conferences. It is always good to get more training whenever available. Conferences offer opportunities to increase knowledge and expand your network of peers and potential customers. 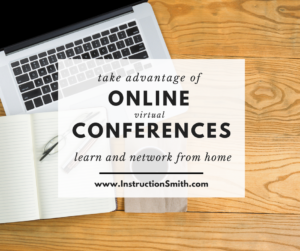 Conferences don’t have to mean travel—some of the best are available to you from the comfort of your own home. The following are two we highly recommend. How do you feel when you meet someone who offers the same services you do? Are you excited to meet a peer, or do you view them as a competitor that you must beware of? Most people will feel either threatened or excited or possibly somewhere in between. Where you come down on this spectrum can be very telling about your general philosophy of business and life. If you believe that there isn’t enough business to go around you will view other people who offer similar services as competitors. Every client they land is one that isn’t on your roster. You avoid sharing any information that might give a competitor ways to improve their offerings or make their work life easier. You hold your knowledge and your resources close to the vest. 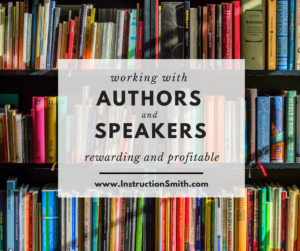 Over the next few weeks we are going to be featuring some of the people who have completed the Professional Author and Speaker Training and Certification Programs. 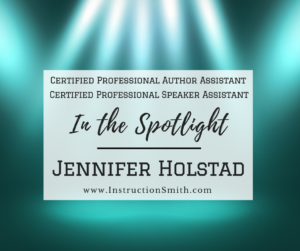 This week we’re shining the InstructionSmith spotlight on Jennifer Holstad. Jennifer has been married for 28-1/2 years, has a 23-year-old son, and a Golden Retriever named Autumn. She is an elementary school spelling bee champion and loves doing jigsaw puzzles, Sudoku, spending time with family and friends, playing board games, watching movies, reading, and watching stock car races. Jennifer has been in business for 22 years and has been blessed to have such wonderful clients (authors, speakers, and business owners). Jennifer is a graduate of both the Professional Author Assistant and Speaker Assistant courses, completing PAA in August 2010 and PSA in April 2013. Before taking these courses, she had already been in business for 15+ years and had already done some work with authors and speakers. She also has an AA degree in Computer Information Systems. We asked her what interested her most about the courses. She shared with us that she knew there was more to be learned about helping authors and speakers. She was also attracted to the flexibility of being able to work through the material and complete the courses at her own pace and in a timeframe that best fit her schedule. What appeals to her still today is having lifetime access to the material and resources as well as support if she ever has any questions. I often talk to Virtual Assistants who are struggling to find clients. When starting a business one of the most pressing concerns is generating revenue. In an effort to fill their practice they try to be all things to all people. In many cases, after years of experience in administrative roles in the corporate world, they have many skills and experience that can be valuable to many different kinds of clients. Casting a wide net will surely yield the best results in finding clients – right? Actually, the answer is no. When I first started my business as a Virtual Assistant I developed a list of things that I could do to help busy entrepreneurs. With over 25 years in a variety of different industries, the list was VERY long. I even created a brochure that listed them all! But what I found was that it only confused potential clients about how they might use my services. There is an old adage in the marketing world that says, “A confused mind says no.” I found that to be true and a disappointingly small percentage of the people I spoke to about using my services actually became clients. I did manage to establish some ongoing client relationships and my business was underway. I pitched my services to many people in networking and in replying to requests for proposals through several VA groups. My rates were not very high (after all, I was desperate for clients) and when I spoke to potential clients I always felt like I had to compete on price. I found myself struggling to make a real profit in my business.